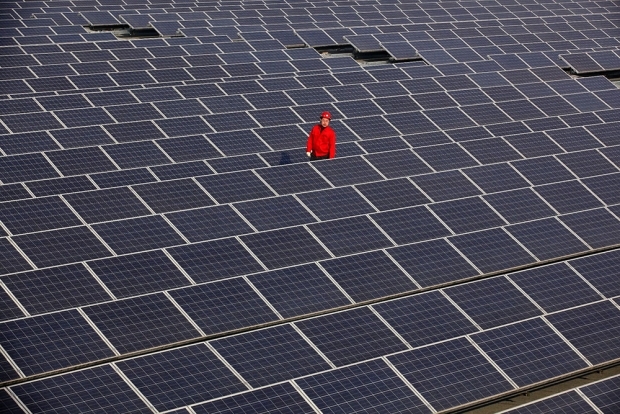 A worker checks rooftop solar panels at a fabrication plant operated by the Jifa Group in Qingdao, Shandong province. In 2012, Suntech Power Holdings Co. was one of eight Chinese solar panel makers ranked among the global top 10 in overall importance. By March of 2013, Suntech had filed for bankruptcy. Excerpted from The Greening of Asia: The Business Case for Solving Asia’s Environmental Emergency by Mark L. Clifford. Copyright © 2015 Mark L. Clifford. Used by arrangement with the author. All rights reserved. Suntech’s growth was impressive. Within a decade of its founding, it went from an unknown start-up to the world’s largest producer of photovoltaic solar modules—a corporate success that seemingly underscored China’s newfound dominance of the clean-tech world. Suntech’s hometown of Wuxi is, by Chinese standards, a midsized city, though its population of more than six million people makes it larger than any U.S. city except New York. It is not far from Shanghai (a high-speed train now makes the journey in forty-five minutes) and lies in the Yangtze River Delta, a region that has proven to be fertile ground for China’s economic growth. It is a particularly entrepreneurial part of the country, and officials there welcomed businesses and encouraged Suntech’s wide-ranging ambitions. Inexpensive products were key to Suntech’s growth. The company had good technology, though it was in no sense on the leading edge of innovation. Indeed, China’s success in solar came from using technology developed beginning in the 1950s at Bell Laboratories in the United States. Bell Labs, which functioned almost as a national laboratory even though it was owned by telephone monopoly AT&T, was at the forefront of the development of semiconductors, and solar power was an offshoot of that effort. Bell Labs’ initial breakthroughs were buttressed by substantial support from the U.S. government, which spent heavily on the development of solar power. The first practical use of solar power was for satellites. Solar allowed for a longer useful life than batteries alone did, and with cost of secondary importance in the early decades of the space race, scientists were able to use the still-expensive technology. The Vanguard I satellite, covered in solar cells, was launched in 1958. In the late 1960s, scientist Elliot Berman discovered that scrap silicon from semiconductor manufacturing, even with imperfections, could be used for solar power. Exxon’s backing of Berman’s discovery lowered manufacturing costs, and solar garnered significant interest as rising oil prices after the 1973 OPEC oil embargo sparked concerns about energy security. A series of innovations since then has continued to push down prices. The price per watt of electricity produced by solar has fallen almost 99 percent since the 1970s, from $70 a watt to 80 cents in 2012.2 By the time Suntech entered the scene, the technology was far enough along that it was able to grow successfully without needing to be more than incrementally innovative. From its early days, Suntech—like so many Chinese companies—focused on exports, counting on its low costs to win sales. With the global solar market growing rapidly, especially where guaranteed high selling costs for solar power stimulated the market, the company was in an enviable position. In 2007, it opened its U.S. headquarters in San Francisco. The next year saw sales offices open in Germany, Spain, South Korea, and Australia. It built a global network of projects at sites ranging from the San Francisco Airport to the Bird’s Nest Stadium at the Beijing Olympics to the Yas Formula One race track in Abu Dhabi. Its solar panels went up on a school in Lebanon and a Harrah’s casino in southern California. Shi was successful beyond imagination. By 2005, Suntech had sales of $226 million. That year—just four years after it was founded—the company went public on the New York Stock Exchange (NYSE), raising $455 million in the exchange’s biggest Chinese offering of the year. It also became the first private Chinese company to list on the Big Board. The next year, as a sign of the company’s importance, Shi was invited to sit on the exchange’s international advisory board. Then came the fall. In March of 2013, after a series of missteps and a default on its bonds, Suntech’s major operating unit filed for bankruptcy, bringing normal business operations at the parent to an end. One can think of China’s industrial structure as “start-up statism.” China fuses some of the world’s most risk-craving, dynamic entrepreneurs with top-down state policies with the help of government-directed capital. Suntech exemplifies what can happen to a company when faced with these forces. Japan and South Korea pursued similar patterns of what economists call financial repression (a policy that lets government issue debt at low rates by denying savers high returns) coupled with government-guided, investment-led, high-growth models, but neither country allowed the sort of anything-goes frenzy seen in China’s solar industry, where hundreds of competing companies started operations within the space of a few years. Because the economic system has few outlets for domestic savings other than bank deposits, stocks, and property purchases, much more money flows to bank deposits than would otherwise be the case. Banks, for their part, must use the money that depositors have entrusted to them. They would lose money if their deposits were left idle, so they recycle these deposits in the form of lending. Consumer lending is discouraged by government diktat, so consumer credit is virtually nonexistent, except for mortgages. (In China, consumer spending accounts for roughly one-third of annual economic growth; in the United States, consumers are responsible for about two-thirds of economic growth.) Instead, most of the money lent by banks is invested in capital projects—in roads and highways and in facilities like steel mills, cement factories, and solar plants. As a result, China’s savings rate and investment rate, two sides of the same coin, are both extraordinarily high, leading to excess funds available for investment and, ultimately, to a large degree of inefficient, wasteful investment.7 Although Japan and South Korea pursued similar unbalanced growth models, penalizing savers and maintaining high levels of investment, no major country has ever saved or invested as much as China. Investment has accounted for at least 30 percent of China’s annual economic growth since the early 1980s, when Deng Xiaoping’s economic reforms began in earnest. Since the turn of the century, the figure has generally been above 40 percent—extremely high by any historical standards. In 2012, the figure was 48 percent. Finally, there is the me-too quality of Chinese companies. A particular strain of entrepreneurship has developed as a result of the Chinese system. Successful businessmen are guided by an overriding drive to grow and thus have the scale to better deal with regulators and banks, rather than focusing on technical innovation and other, more mundane operating aspects of well-run businesses. Profitability suffers because of these high levels of copycat investments. From 2005 to 2010, operating profits of the ten largest photovoltaic manu-facturers ranged between about 15 percent and 17 percent, with a dip to 7.9 percent in 2009, the year of the global financial crisis.10 After 2010, profit margins were obliterated. According to an analysis by PricewaterhouseCoopers, the ten largest solar companies reported an operating loss in 2011 equivalent to 1.2 percent of sales. The actual loss was higher because operating losses do not include interest expenses or taxes. The solar industry showed the limits of China’s central government. Although China is a good example of what development literature calls a strong state, where government can set and enforce rules with relative autonomy, the country is simply too big and there are too many conflicting interests even within government itself for national economic policies to consistently prevail. In industries that are particularly capital-intensive and in which the state feels it has a strong national security interest, national policies usually stay in force; telecommunications, utilities, and petroleum are all examples of this. But even here, there are limits to Beijing’s power. Local interests often determine whose electrical solar or wind power gets dispatched, and thus who gets paid, from among myriad power producers. This ground-level favoritism has had significant negative consequences for some solar operators. China has spent almost $50 billion in little more than a decade building the world’s largest solar manufacturing industry. By some accounts, it has little to show for the effort. Its companies have yet to demonstrate that they are viable, at least as measured by their ability to earn profits. In fact, cynics could argue that China’s solar effort is a mirage, built on subsidized electricity, most of it produced by coal-fired power plants and often using dirty manufacturing processes that have themselves resulted in environmental damage; financed with large amounts of inexpensive loans; and benefiting from preferential land and tax policies. Yet to leave it at this is to misunderstand the full scope of the revolution. Solar power is an increasingly important part of the global energy mix, thanks to the success of Suntech and others in bringing prices down so far, so fast—with the result that solar is competitive with many other forms of conventional fossil-fueled power. Suntech’s Shi Zhengrong was a revolutionary. But he was not able to reap the rewards of the changes he wrought, changes whose effects will be felt for many decades to come. The Sun King is dead, but his revolution lives on.